I like sitting in windows sills. They're tight and cosy; I like spaces that seem to embrace you, and you can have complete contact with the outside world without really leaving the room you're in. They're a sort of place in-between outside and inside, and that is fascinating. On the other hand, the further into the façade you put the windows, the longer they last, because they receive less sun, wind and rain, and to make it work you need thick walls of course (but who doesn't want that, really?). Still, windows sills you can sit in all year around really do something for a room, and aligning the windows with the façade looks quite cool, so I can't do anything but recommend you to do just that if you're designing a place with windows. 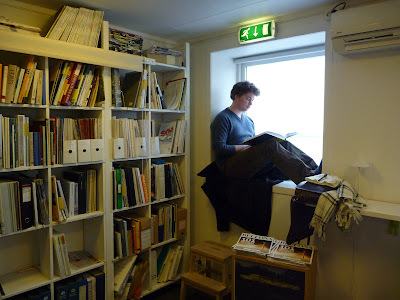 The picture was taken today, in the library at BAS, by a nice librarian. She didn't mind me sitting in the window or taking my shoes off and walking around in my socks. Just the sort of library I like! Cool! I like your blog.